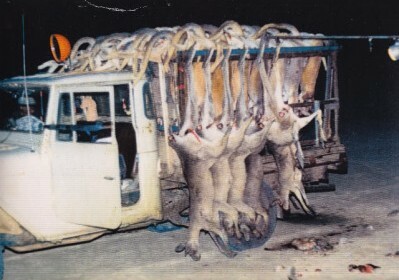 Kangaroos-Myths and Realities was written to create awareness about the plight of kangaroos and their joeys because narrow media ownership has played a significant role in ensuring that Australians are kept UNAWARE of the true nature of the slaughter. An unchallenged coalition of scientists have been allowed to turn a protected species into meat and hides. This group of self-serving scientists, regulators and industry lobbyists combine to create an industry that artificially manipulates kangaroo populations to breed next years’ crop, defying natural selection, calling it a ‘sustainable’ harvest, and leaving kangaroo populations a teetering pyramid. “To harvest a sustained yield from a population at steady density, it first must be manipulated in some way to promote the rate of increase. Rates of harvest may be raised to levels at which they can cause the extinction of the population. These scientists saw that is was in their interests to support and promote the kangaroo industry to gain consultancies and funding from the government. They ignore and reject the non-consumptive use, and intrinsic value of kangaroos because their arguments are confounded when there are non-consumptive values attached to their resource such as tourism. This total disregard for important stakeholders such as the $6 billion dollar nature-based tourism industry, and breaches of ecological and scientific oversight are indeed very serious. We seek an end to the brutality to kangaroos and to their joeys. Millions of young-at-foot joeys have been abandoned to a cruel fate over past decade for which a flawed and deficient Code of Practice provides no protection, whatsoever. We ask you in the MEDIA for your help to turn from brutality to a mega billion dollar source of income from tourism, to provide unlimited benefits from our magnificent unique wildlife, to rural Australia. They say there is nothing like an idea whose time has come and we believe the time is NOW for Australia to EMBRACE the kangaroo as its enduring, proud and strong symbol ~ The time is NOW for all Australians to join the rest of the world and start to appreciate what we have in our own backyard. 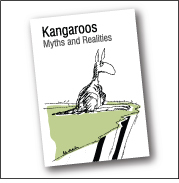 We hope that you will read Kangaroos Myths and Realities.